Quick hotkeys to print screen in Windows 10. Other method to take screenshots on Windows 10, save to directory location by file type jpg png. Screenshot is an ideal way to show your friends interesting moments on your screen, demonstrate your work progress to your colleagues, show a computer expert the error screen you met on your computer, or anything else on your screen that you want to capture, record, save or send to someone else. Print screen methods listed below are applicable to both Windows 10 64 bit and 32 bit. However, the snipping tool screenshot taking method will not be applicable in Windows 10 basic because snipping tool feature is not installed in Windows 10 basic by default. In Windows 10, taking a screenshot, or often known as print screen, can be done easily depending on how you want it to be captured and what kind of outcome you are expecting. We will show you all the possible methods of taking a screenshot on Windows 10 and what kind of print screen they will produce. This is by far the easiest print screen solution for Windows 10 users. It is also applicable to Windows 8. By pressing only two simple keys, you will be able to take a screenshot and automatically save it onto your hard drive. When you hold Windows key (beside ALT) and press the print screen button (PR Sc SysRq button), Windows 10 will capture whatever that is currently on your computer screen and save it into your Users\Pictures\Screenshots folder. To access to this folder, click on the Start button, go to File Explorer. Click on the This PC from the left panel of the window. You should now see the Pictures folder in the window. That’s where your screenshot will be saved every time you hit Win Key + Print Screen buttons. The screenshots taken will automatically be saved as PNG file. There isn’t any option so far that we can change or select the screenshot file type that we desire. It works for most full screen applications and games except for some unique steam games such as CS GO. For steam users, you may want to try using the steam default print screen shortcut keys, the F12 keys to take a screenshot of your game. Workaround for when this Windows 10 print screen button doesn’t work on a full screen application or game: Change the game to Windowed mode or Borderless Windowed mode and try to take a screenshot again. This is the good old method that we have been using since Windows XP (or maybe even older). The downside of this method is that you will have to manually paste and save your screenshot using an image editor tool such as the Windows 10 built in picture editor, Paint. To take a screenshot this way, press the print screen button to capture your current screen. This will save your screenshot into your clipboard. Go to start, search for Paint and launch it. Right click then select Paste or simply hold and press CTRL and V to paste the screenshot that you have taken earlier. Now, save the picture as any file format type you desire into any directory location you want. Same method applies to any image editor you like. Apart from using the print screen button on your keyboard, you can also use the Windows 10 built in print screen application, Snipping tool, to take a screenshot on Windows 10. Snipping tool allows you to manually highlight only the area that you want it to capture, capturing only a certain active window or capture the entire screen. You can also delay the capturing so that you have time to prepare whatever you want to capture before taking a screenshot. It works more like an auto timer for screenshot taking. It has a simple built in image editor that you can crop, erase and highlight the screenshot taken. To select the method of capturing in Snipping tool, launch Snipping tool by going to Start then search for Snipping tool. Press on the drop down menu beside the New button. Select your desired form of screenshot taking. 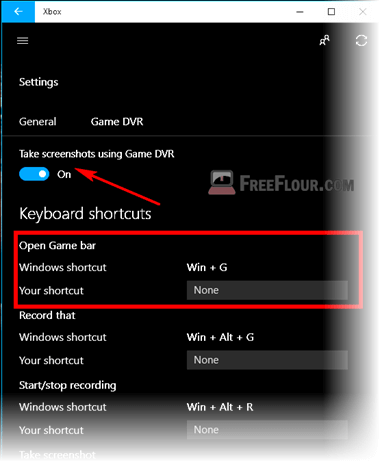 This method is a little bit complicated as you need to enable Game Bar in the Xbox app before you can start taking screenshot for your games. But when you get used to it, it should be the best method to capture screenshots or record videos for your games. Yes, it also includes a feature to record a video of whatever that is happening on your screen. In order to open the Game bar, you will have to first enable the Game DVR in the Xbox app. When it’s enabled, you can change the shortcut keys or hotkeys for types of different actions to take a screenshot or record a video in a game. By default, Win + G will open the Game Bar that provides you with buttons to print screen or start recording a video. Press Win + Alt + R to start recording right away. Win + Alt + G will record the last 30 seconds of your game play.